The Roxbury Motel features over 20 theme rooms. Mountains enchant. Gazing at them makes one wonder what the view up there is like, and what might be on the other side. In the Delaware County Catskills, the answers are clear: The view up there is gorgeous, and on the other side of any given peak, you'll find wonders to explore. Burr Hubbell's family has been in the Catskills for eight generations now, six on the Hubbell Family Farm in Margaretville. He's seen the family business transition from dairy to building supply sales and equipment rental, and is now the proud owner of 26 Highland cattle and some Berkshire pigs, "trying to find a role in the farm to table movement," he says. Hubbell, who's lived in Washington, DC, and the Finger Lakes, says he's never at a loss for fun, culture, or a great meal. "I like going out to all the restaurants, so many great places," he says. "I'm active in local theater and a founding member of the Catskills Community Chorale. The local theaters up here get packed with a mix: locals, weekenders, transplants. The Roxbury Arts Group does great events. I'm on the board of the Hanford Mills Museum; we're planning for our 50th anniversary in five years. There's a ton of history up here: the Anti-Rent War; our heritage tourist railroad, the Ulster and Delaware, in Arkville; there's also a Civil War deserters' cave. There are so many cool things on and off the beaten path if you know where to look." The Anti-Rent War was a tenants' revolt that started in 1839, when a reasonable land baron died and his heirs began making what the tenants considered unreasonable demands. Catskills farmers and tradesfolk, disguised as what they called "Calico Indians," rebelled after getting no relief in the courts. The insurrection smoldered until 1845, when leaders were brought to trial; one, Smith Boughton, was sentenced to life and pardoned a year later when a sympathetic governor was elected. The state constitution of 1846 included tenants' rights measures and did away with feudal "tenures" and leases over 12 years long, and the "patroon" system of land ownership was dead shortly afterward. The Catskills breed world-changers in their peaceful hills. The first town you'll encounter when headed northwest, Delaware County's Middletown, contains Margaretville—home of a lot of exceptional shopping. There's the Cheese Barrel & Gourmet Shop, where they make killer gift baskets. Home Goods of Margaretville offers all kinds of topflight practical accessories, and the Longyear Gallery is a collective featuring both upstate and downstate artists. More deliciousness can be found at Catskill Candies and Confections. And don't miss the Maple Shade Farm Market or the Catskill Artisans Guild. Catskills flair means innovation. Margaretville is home base for Cosmik Ice Cream, organic for your health and freeze-dried. In nearby Fleischmanns, you'll find Cheezehound, headquarters for organic, artisanal vegan cheese that's marketed from Kingston to Brooklyn and beyond. Cheese has been a Catskills mainstay for many a year. When the economy made milk and butter production impractical for small family farms, some thought Catskills dairy was doomed. Instead, it's been reinvented, with small herds of cows and goats providing the raw materials for a host of artisanal makers such as Betty Acres, Bovina Valley, and Dirty Girl. Cheese is far from the only foodie art masterfully practiced up here. Small bakeries and cafes are sprinkled through the region like chocolate bits, offering fresh food made with local ingredients. Some of it is downright unexpected: Kimchee Harvest is a flagship product of East Branch Farms in Roxbury, where the maker is promoting Probiotics for Peace. Kabinett & Kammer is a contemporary curiosity shop in Andes. Roxbury, up Route 30 from Margaretville, is a wonder in itself. 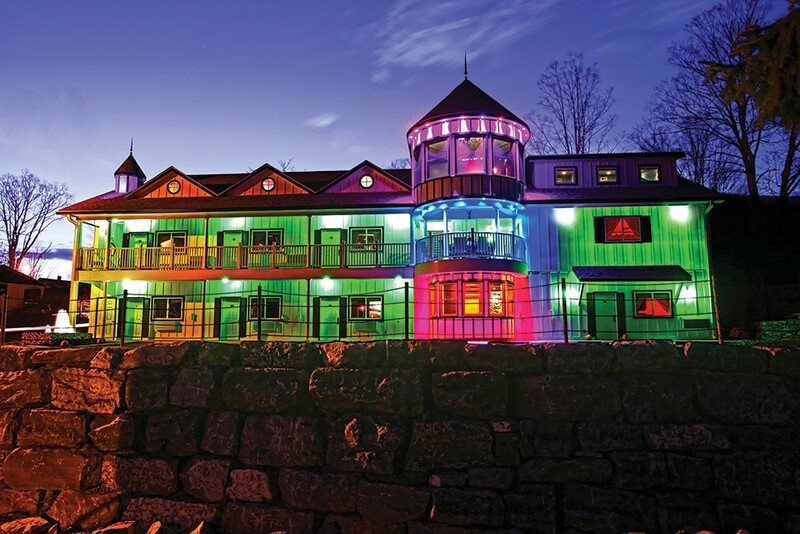 Its ski resort, Plattekill Mountain, is something of a best-kept secret for those who enjoy exciting and uncrowded slopes served with old-fashioned hospitality. Its arts organization, the Roxbury Arts Group, offers exhibits and events and everything from Dungeons and Dragons Night to yoga. "We have such a wonderful array of folks up here," says Robin Factor, who owns Roxbury General with her husband Doug McLaurine. "Typical reaction of someone coming up from Woodstock: 'This is amazing, it's like Brigadoon!' It's such a chill town. If you want to just do nothing, no one bothers you, if you want to do stuff, there's so much more than you'd expect. We get a lot of international visitors staying at the Roxbury Motel, a destination in itself. A lot of artists, because the landscape is so special. And we're seeing a lot of younger couples buying their second homes first—they can't afford to buy in the city, but they can come up here and not need a wheelbarrow full of money." 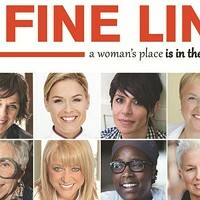 Factor and McLaurine vacationed here for seven years before realizing they could make a living providing a venue for everything from Catskills-made foods and crafts to bike rentals and book signings. There's a demographic shift, says Factor, from past generations who came here to relish the hunting and fishing (both of which are still well loved and amply supplied with gear and guides by local businesses) to younger folks who prefer hiking, biking, the arts, and a good meal out. 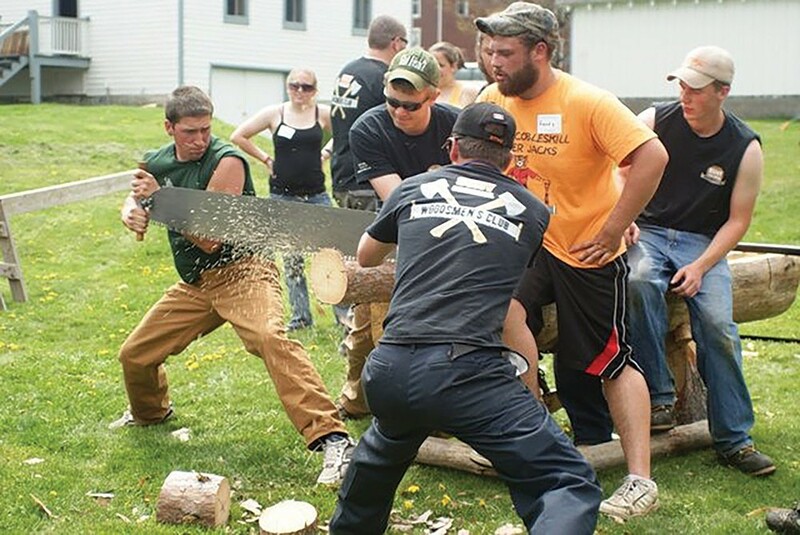 The SUNY Cobleskill Woodsmen's Club at the Hanford Mills Museum's Lumberjack Festival. Photo: Hanford Mills Museum. Cutting edge art and fine antiques can be discovered around every turn—well, most every turn, some turns simply lead to craggy emerald valleys and glorious vistas, or surprising venues like the West Kortright Center, which produces concerts and hosts art shows in a repurposed countryside church. Peg Ellsworth, executive director of the 40-year-old MARK rural development project based in Arkville, believes even greater things are to come. "We have a healthy and varied wedding industry that has become an economic engine—couples come to get married and then move here," she says. "The creative environment, the pristine outdoors, the resurgence of boutique farms—both the natives and the people drawn here are hardy and smart." Delaware County lies within the New York City watershed, which has given rise to land-use restrictions that locals have at times found burdensome. Those same restrictions, however, have resulted in enormous swaths of pristine, unspoiled scenery. And the city's Department of Environmental Protection keeps thousands of acres of land and water open for low-impact public use; you can get a free permit online that grants access to hiking, hunting, and fishing spots all through the region. Delaware County has several dozen such locations. Just like the natural beauty, the creativity's sprinkled everywhere up here. At Atelier Aubergine in Andes, you'll find stunning stained glass. 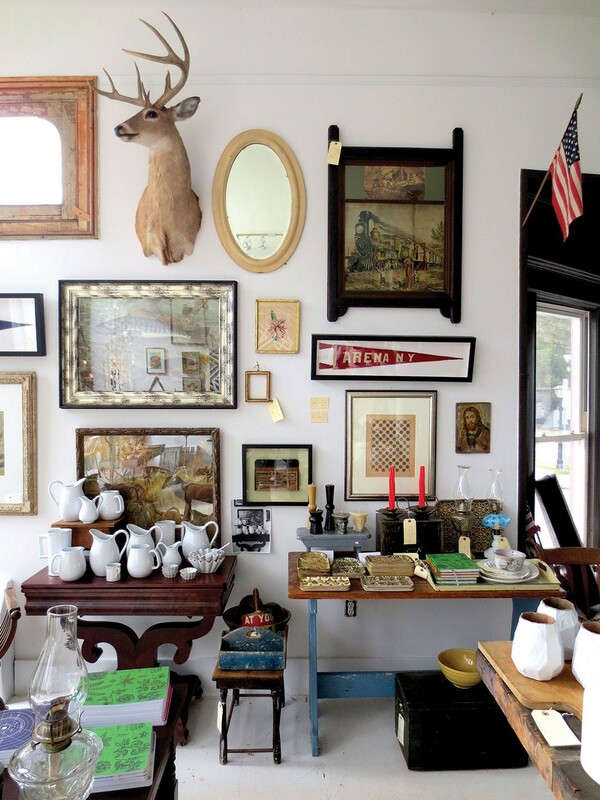 Tandem Antiques, also of Hudson, has just opened a new shop in Stamford offering everything from genuine primitives to modern art. Up Route 28, past Andes, is the college town of Delhi. The 1797 Gideon Frisbee House, home of the Delaware County Historical Association, has a blacksmith shop, schoolhouse, 19th-century gun shop, and turnpike tollhouse, along with two rooms of exhibits. Stop in at Good Cheap Food, a buying club turned co-op store, or Catskills Regional Harvest to stock up on local goodies at exceptional prices. The loose leaf blends at Tay Tea are born here, in a shop that's a tea lover's paradise. The Mid-Century Modern-inspired stoneware table lamps at Stone and Sawyer are handmade onsite, made from locally sourced materials. Farther out along Route 10 is Stamford. A tiny village within it, Hobart, is headquarters for what may be the vehicle of the future. "When I left my old job, I thought about what I really wanted to do, and remembered how I was always drawing cars in elementary school," says Bollinger Motors founder Robert Bollinger, who spent 15 years helping to run and market personal care products for John Masters Organics in New York City. 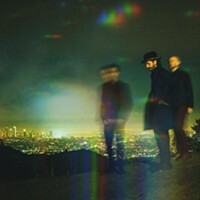 "So I thought, crazy as it sounds, let's get some smart guys together and make something. What would we do if we were to completely reinvent the truck?" The resulting prototype, a fully electric SUV with a fascinating and versatile body design, should be on the market in around 18 months. And when the Bollinger B-1 does hit the market, drivers will be able to recharge for free at charging stations in Margaretville, Hobart, and Delhi. Bollinger has no regrets. He's in love with his Harpersfield farmstead, the river valley views from his shop, and the neighborhood. "There's a great British pub, the Bull & Garland. And the bookstores are great." 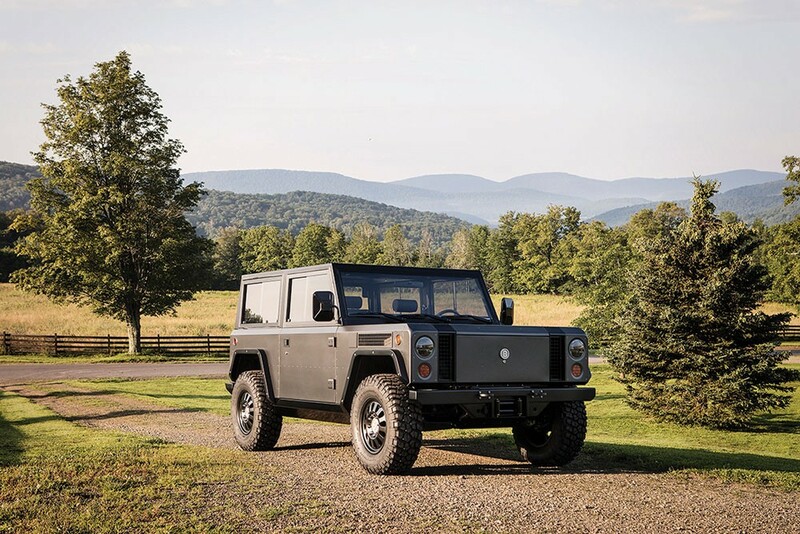 The Bollinger B-1, a fully electric SUV made by Hobart-based Bollinger Motors. Photo by Torkil Stavdal. Bookstores in a tiny village in the hills? Yes. Six of them. Hobart reinvented itself as a book village a few years ago, and the offerings and specialties draw visitors from everywhere. The newest shop, Creative Corner, offers books on all things DIY. "A lot of fun happens here!" says co-owner Kathy Duyer. "There's a powerful sense of community." All six bookstores are open weekends and holiday Mondays in winter; in summertime, it's seven days a week.